Has the Hyundai Sonata lost its mojo after redesign? Hyundai sold 41,994 new Sonatas in the first four months following its launch in the U.S., 13 percent fewer than its predecessor, according to an analyst at NH Investment & Securities. SEOUL (Reuters) -- The revamped Sonata sedan was supposed to help Hyundai Motor Co. reverse sluggish sales, but the car described by some critics as a bland substitute for its popular predecessor is off to a slow start in the key U.S. market. The tepid reception for the new Sonata in Hyundai's biggest market after China is more trouble for the South Korean automaker, which is battling intensifying competition and a strong local currency. Hyundai is expected to post a 9 percent fall in its third-quarter net profit when it releases its quarterly earnings on Thursday. Industry analysts say the new Sonata, launched in the U.S. in June, has struggled to stand out on design and value in a crowded field where rival sedans such as Nissan's Altima and Honda's Accord offer more attractive prices or designs. In contrast, the Sonata's predecessor helped Hyundai expand its U.S. market share after it was launched there in 2010. 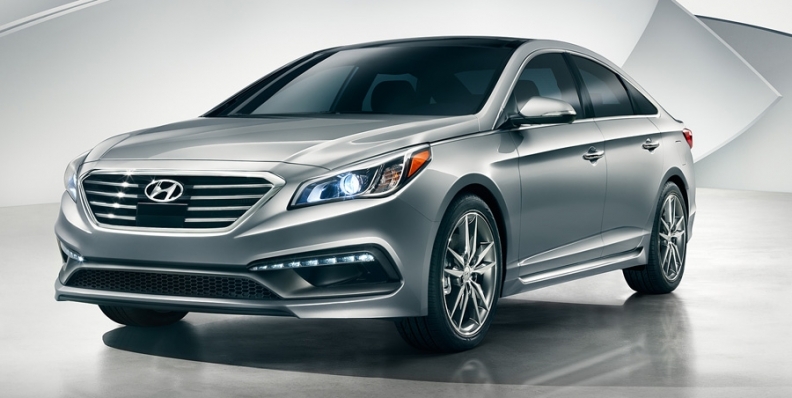 "The new Sonata product super-exceeds the previous model in every way, shape, or form. But consumers are very much driven by what the vehicle looks like," said Scott Fink, CEO of Hyundai of New Port Richey, Fla., which is Hyundai's biggest U.S. dealer. "You used to be able to pick out the predecessor model anywhere on the road, in a parking lot. Now in some regards, you have to go to the front of the car and look at the logo to make sure: 'Oh! that's my car,’” he told Reuters. A New York Times review this month described the new Sonata's design as "bland" and "boring". Reuters had earlier reported that Hyundai deliberately made the model less bold and more angular than its curvy predecessor to appeal to more conservative tastes in South Korea. Hyundai sold 41,994 new Sonatas in the first four months following its launch in the U.S., 13 percent fewer than its predecessor, according to Lee Sang-hyun, an analyst at NH Investment & Securities. At home, sales have lost momentum, nearly halving to 6,861 in September from 11,904 in April when the model was rolled out, according to company data. To reach its internal 2014 U.S. sales target of 92,500, Hyundai needs to sell nearly 17,000 new Sonatas per month for the rest of the year, more than the 10,500 cars it has sold, on average, every month since its June debut, said Suh Sung-moon, an analyst at Korea Investment & Securities in Seoul. Hyundai declined to provide U.S. sales targets or figures and said it was premature to judge the new Sonata's sales performance. Hyundai’s U.S. sales are up 2 percent in the year to September, while overall U.S. car sales during the period rose 6 percent. "Sales and marketing have not started in full yet," Hyundai spokesman Zayong Koo said. "The feedback we get from dealers is that the more you look at the new Sonata, the more appealing it is." Apart from design issues, analysts say the Sonata's higher pricing has dampened its appeal in the U.S., where more consumers are now choosing SUVs over sedans. A fully optioned Sonata costs over $34,000 in the U.S., more than the $32,000 for a top range Nissan Altima, said Dave Sullivan, an analyst at consultancy AutoPacific. Rival carmakers like Toyota and Honda also offer more incentives. In September, Hyundai offered incentives to buyers of $1,480 for each Sonata sold, compared with $2,297 for the Toyota Camry and $2,036 for the Honda Accord, Edmunds.com said. Hyundai could help the new Sonata's prospects in the U.S. by offering more buyer incentives, building lower-priced and less equipped versions and increasing marketing, said Fink. "It's just going to take a little time. I'm optimistic," he added.